If only gardening were this quick and easy, we'd all have gorgeous ones. I managed to focus on this one and get it all finished up a little while ago. I washed it and let it dry. it's now ready to go to its new home. Ela has been struggling with illness for over a month now. This is a fast-to- make quilt - I didn't want to give it to her 2 or 3 months from now - i wanted to get it to her THIS week. So...I knew it had to minimal piecing with maximum impact. I also know that she loves working outside in her flowers. She also sews. I mentioned this before when I wrote about the top. 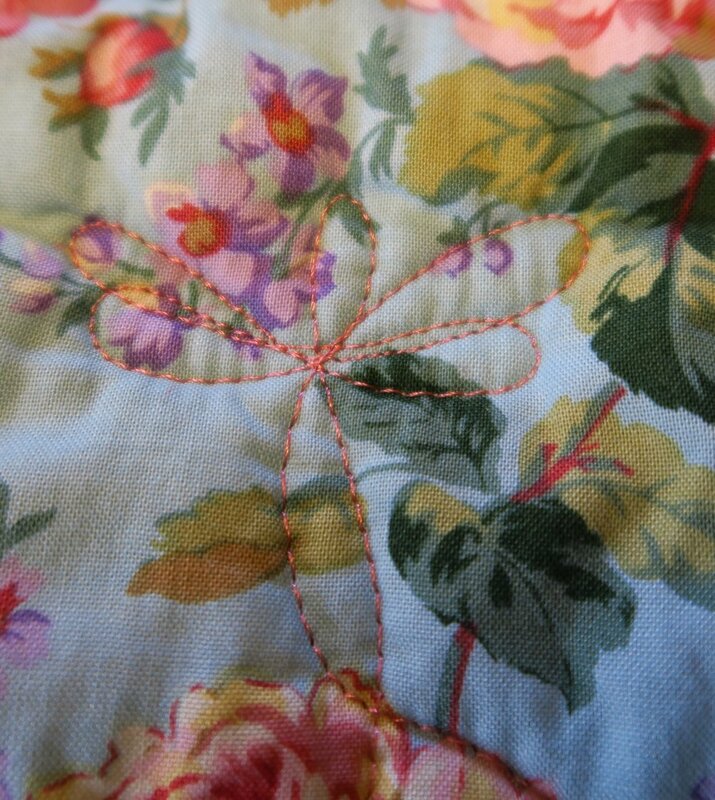 I like giving quilts to people who sew - I think they actually appreciate them more than someone who doesn't! I decided to tackle quilting this top right away. 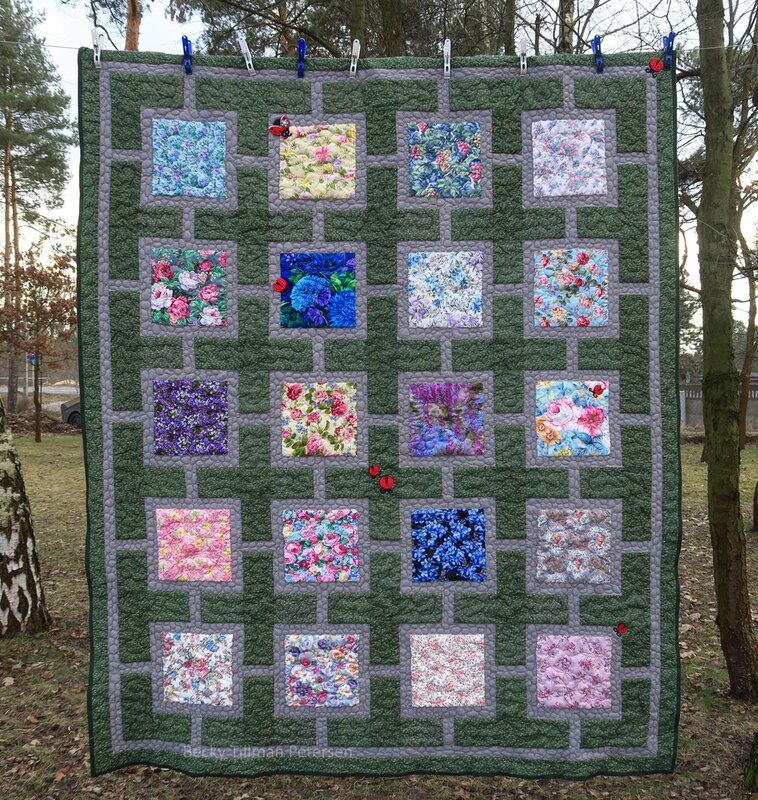 I started with making cobblestones by quilting. This took quite a long time and a lot of thread! It may have taken longer to quilt the cobblestones than to piece the entire top. I covered all the gray strips with these cobblestones to represent a stone walkway. This type of walkway is very common here in Poland - esp. in older areas such as those around castles and town centers. I used a Polish folk print for the backing. I asked in my Facebook group about ideas about how to quilt dragonflies. I put 3 or 4 in each floral area - but they aren't that great - the problem was me - but in truth, you can't see them very well - which is also okay. :) The worse ones just look sort of a like a flower. At the very end, I sewed on some felt ladybugs that I found at my local wholesale outlet. They are made of felt and should hold up well. Here's a picture of the center - a little closer up so you can see the flowers. And the quilt roll! I can't resist! The day was nice for taking pictures - at least when it wasn't raining or hailing. March can be like that here in Poland! I did update the pattern with new pictures. It's here if you want it. Don't forget to check out the goodies my sis has for you over in the store!